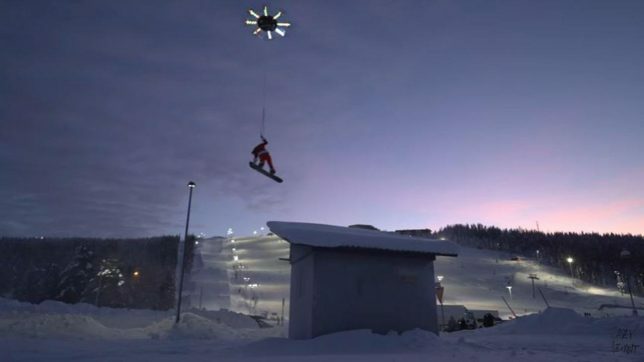 “This isn’t fake, I promise,” said filmmaker Casey Neistat as he announced the impending debut of his ‘Human Flying Drone Holiday Movie’ on Twitter with a dubious-looking graphic. Anyone who saw that tweet could be forgiven for their skepticism, especially since Neistat was teaming up with fellow YouTube star Jesse Wellens of the channel PrankvsPrank to pull off the stunt. 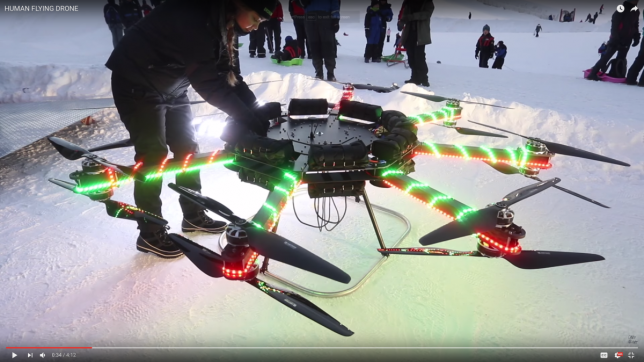 But by all accounts, this footage of the ‘world’s largest homemade drone’ is real, and a Santa-suited Neistat is actually flying 25 feet in the air. No one in the world sells a drone that can lift a human being, so Neistat and his team set out to create one. 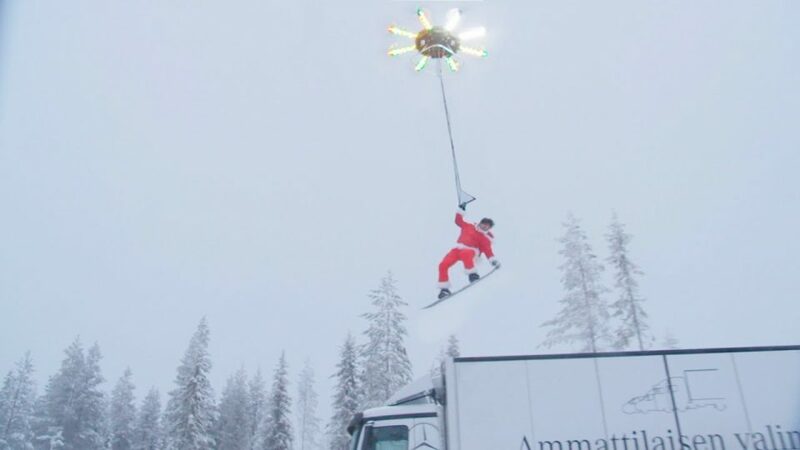 The octocopter drone, which is augmented with a Samsung Galaxy Gear 360 action camera, reportedly took over a year to build, and the video clip was shot at a ski resort in Finland over the course of four days. In it, the daredevil YouTuber zooms down a slope on a snowboard and then takes off into the sky, going higher and higher before the final jump takes him 100 feet into the air, as smoke bombs fastened to his feet emit vivid pink plumes. One thing that’s not quite what it seems is Neistat’s single-handed grip on the handle: he’s actually securely fastened to the drone, dubbed ‘Janet,’ by a body harness. The rest of it, as far as anyone can tell, is legit. Looks like fun! Check out how it’s done in the behind-the-scenes video above.